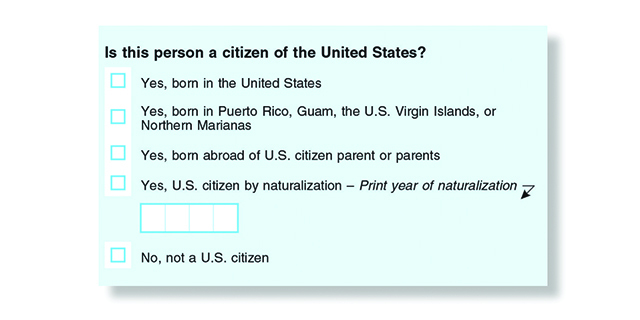 The 2020 United States Census will ask respondents if they are citizens, a question that has inspired multiple law suits in an attempt to prevent the use of the question. Census Citizenship Question Trial Could Start Day Before Midterm Elections (Source: National Public Radio) "The first potential trial of the six lawsuits over the hotly contested 2020 census citizenship question could kick off the day before voters head to the polls for the upcoming midterm elections." Supreme Court Blocks Quiz of Commerce Secretary in Census Controversy (Source: The Wall Street Journal) "The court, in a brief written order, stayed the effect of a lower-court ruling that had required Mr. Ross to sit for a deposition conducted by lawyers for a group of 18 states and other plaintiffs who are challenging the lawfulness of the administration’s move to add the citizenship question." For the first time since 1950, the U.S. Census Bureau is planning to ask everyone living in the United States whether they are citizens when it conducts its next decennial census in 2020. Anticipating that some immigrants might avoid answering the question, the Trump administration wants to try using other government records to fill in missing responses. The Justice Department sought to include the question because it uses data about eligible voters – the citizen voting-age population – to help enforce protections for minority voters (including those who speak languages other than English) under the federal Voting Rights Act. The Justice Department now relies on data from the Census Bureau’s American Community Survey, a sample survey that covers 2.6% of the population each year. The department wants more “scope, detail and certainty” that only the full census can provide to enforce the Voting Rights Act, Ross said. Aside from the current 2018 year turmoil regarding the measures of gaining or securing US citizenship, this action inspired some questions regarding the origins of US citizenship. Were the Framers of the Constitution citizens of the United States at the time of its ratification? If so, by what legal and/or political measures. in the bulleted list above further highlights that none of the Framers, Signers, or (Founding) Fathers (Source: Wikipedia) were born in the United States since the United States did not exist until after the ratification of the US Constitution. Does this preempt the concept of Jus soli (Source: Wikipedia) ("meaning "right of the soil", commonly referred to as birthright citizenship in the United States, is the right of anyone born in the territory of a state to nationality or citizenship."). The Bill of Rights does not contain the term "citizen" or "Citizen of the United States". Given the fact that not a single of the Framers, Signers, and Founding Fathers were "born in the United States", were any of the Framers, Signers, or Founding Fathers citizens of the United States; and if yes, by what specific legal or political means did those individuals become citizens of the United States? The first law passed by the nation the established a regulation on how Citizenship would be gained by new immigrants came with the Naturalization Act of 1790, though it was limited to "Free white person(s)." The LA times has a broader list tracking the major milestones in US Citizenship. Not the answer you're looking for? Browse other questions tagged united-states constitution citizenship or ask your own question. Are persons born in a U.S. embassy a U.S. citizen, if their parents are not citizens? Voter registration fraud: how is citizenship checked? Are non-U.S. citizens permitted the same rights afforded by the constitution? Is there polling to suggest that a majority of United Kingdom citizens would favour a codified constitution? If United States annexed part of another country, would someone born in that place be eligible to run for president? Why does the USA restrict president candidates to natural-born citizens?